The earliest technique of hair transplant is Follicular Unit or FUT hair transplant Technique. This hair transplant technique is also called the Strip Method of hair transplant. In this technique of treatment, a strip of scalp bearing hairs of appropriate density is excised from the back of the scalp. This technique of treatment you will do by hair transplant in Delhi. There is a specific area over the back of your scalp, that bears the hair follicle which is resistant to shedding. The hair of this area does not shed even in the most extreme of the conditions. Even under severe nutritional deficiency, this area of the hair follicle is not shed. Even DHT cannot harm the root of hair follicle of this region. The hair of this area is the last hair to fall from our scalp. Even they are resistant to aging and are even present when the person reaches the age of 80s & 90s. During a hair transplant, it is preferable but not mandatory to harvest hair follicles from this area of the scalp. During FUT transplant technique the strip is marked in curvilinear fashion at the central portion of this area. The procedure room/operation theatre is fumigated beforehand. Local anesthetic solution is then injected. At Hair transplant in Delhi, the donor area is injected superficially first, followed by a slightly deep injection along the entire hairline to create field anesthesia. The width of the strip is determined by the laxity of the patient’s scalp in order to yield the maximum number of grafts and limiting the tension on closing the edges. Which is done very perfectly and carefully by Hair transplant in Delhi. The Hair transplant in Delhi Using either a single No. 11 or No. 15 blade the demarcated skin strip is incised. The Hair transplant in Delhi Using fine blade which is inserted at a specific angle to the scalp which parallels the angle of the hair follicles to avoid transaction of the hair follicle roots. By use of the tumescent solution for infiltration during Hair transplant we minimize the follicle transection by appropriately aligning the hair follicles during a hair transplant. During a Hair transplant in Delhi, the tumescent solution provides a plane between the hair follicle base and the larger nerve plexuses & vessels. This prevents accidental cutting of nerves and blood vessels during a Hair treatment. The tumescent solution also has one of its contents which prevents excessive scarring and healing after the hair transplant procedure. Hair transplant in Delhi very Carefully is taken while removing strip during hair transplant to not to damage the underlying blood vessels namely occipital artery, posterior branch of superficial temporal artery and anterior branch of the superficial temporal artery. 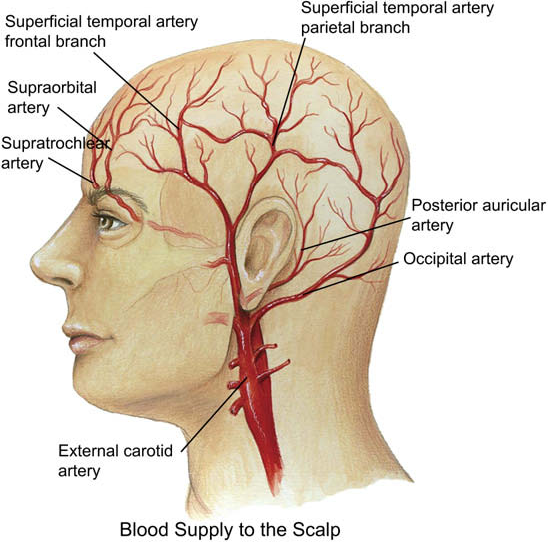 The unskilled surgeon can damage these blood vessels and can lead to torrential bleeding from the hair transplant wound. Excessive blood loss can lead to hypovolemic shock and the patient can die if not managed well. For this reason, it is utmost important to get hair transplant procedure done from a qualified doctor who can manage medical and surgical emergencies. Care is also taken that dissection should not be deep as this can damage the nerves supplying the scalp. This can lead to sensory loss over the area of the scalp after a hair transplant. This sensory loss can be temporary for a few months or can be permanent which can last for many years. After removal of the skin strip, the upper and lower flaps of the scalp are mobilized so as to make the skin closure tension free. Mobilization is also very tricky procedure as if not done in the right plane then it can lead to flap necrosis and scarring over the donor area of the scalp. Conceal the resultant scar of the FUT hair transplant. After flap mobilization, the next step is the closure of the defect created after removal of the strip of the scalp in FUT hair transplant. The closure is done in multiple layers so that the scar resulting from hair transplant does not stretch over the period of time. The closure is done in a zig-zag manner and this type of closure is also called ” Trichophytic closure”. This is done to conceal the resultant scar of the FUT hair transplant. 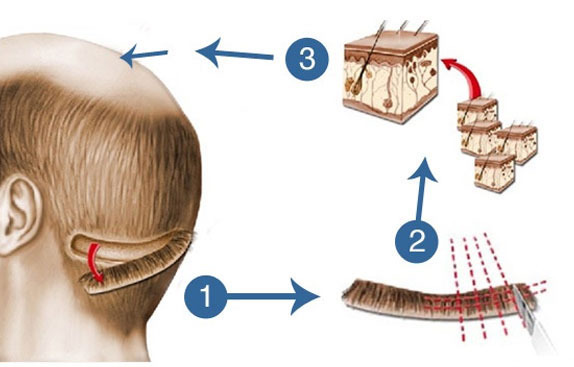 Hair Transplant by strip method, In hair transplant the edges are closed using absorbable sutures (vicrly) and the outer layer with non-absorbable sutures (ethilon/prolene). The donor area is again prepped with betadine solution. The donor area is then covered with sterile dressings. A larger number of hair follicle units can be harvested in a shorter period of time. this reduces the overall time duration of hair transplant. In FUT hair transplant as the dissection is done under direct vision, the rate of the transaction of hair follicles is lower. Ability to include the protective surrounding tissue of hair follicles which contain the stem cell during FUT hair transplant. This surrounding tissue and the containing stem cell help in faster growth of transplanted hair follicle. Another advantage of FUT hair transplant technique is that the remaining scalp is left undisturbed and can be used for repeat hair transplant, harvesting of the hair follicles using either FUT method of hair transplant. Graft loss up to 30 %; Pain over the donor area; Loss of blood; Loss of sensation; Infection; Abscess; Ugly scar; Hypertrophic scarring; Keloid formation; Cancer formation. Graft loss up to 30%: The most important drawback of FUT hair transplant is that during FUT hair transplant up to 30% of the hairs removed from the donor area are dead even before getting transplanted. This means that from 100 hair follicles only 60-70 hair follicles survive before getting implanted over the bald area. This happens because in FUT hair transplant removed hair follicles remain out of the body for around 4 hours on an average. And for every hour kept outside the body, there is the death of 10% hair follicles. Why are the hair follicles kept so long outside the body in FUT hair transplant? In FUT hair transplant the removed strip skin is kept outside the body and divided slowly into many tiny bits. These tiny bits are again divided into still smaller pieces. From these smaller pieces of hair, follicles are then separated and isolated. The extra skin attached to the hair follicles is then again removed slowly to prevent cutting the hair follicle root. All this time outside the body tissues leads to loss of many hundred hair follicles. Pain over the donor area: FUT hair transplant is painful as it is a proper surgery where the knife is used and there is cutting of body tissues. And surgery is painful unless sedation is used. Loss of blood: As small arteries are cut there is bleeding during FUT hair transplant. If a bigger artery gets cut then it can lead to heavy bleeding and shock leading to patient collapsing in operation theatre. Loss of sensation: The nerves over the occipital region of the scalp or their branches get cut during FUT hair transplant. This leads to loss of sensation over the scalp which can last for many months to many years. the return of sensation is almost always incomplete. Pain over the neck: in FUT hair transplant the skin over the back of the neck gets stretched and there is tightness over the back of the neck. Whenever you will flex your neck for example while looking down you will feel sharp pain over the back of your neck. This pain can last for many months. Infection: as the incision is deep and there is a breach in the natural defense of the skin there are high chances of wound infection in FUT hair transplant. This wound infection can spread over the whole of the scalp and can lead to scalp necrosis and loss of scalp skin. Abscess: Stitch site abscess is a very common problem after FUT hair transplant. 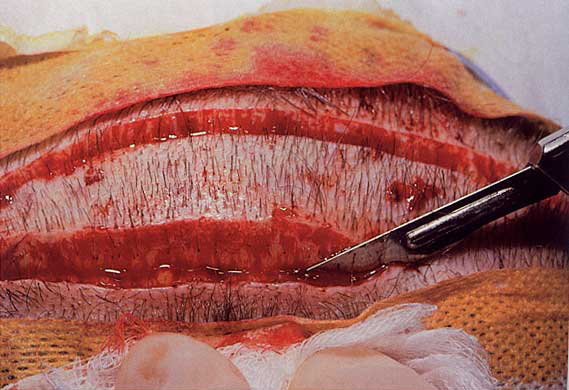 Sutures are a foreign body and they lack the natural defense of body tissues. They are kept over the donor area for a long time. 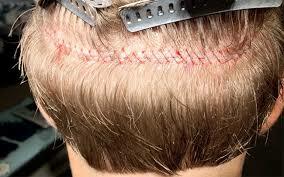 Bacteria can easily pass along the suture and can get inside the deeper tissues of the scalp. This can lead to abscess formation and its complications. Long healing time: The stitches in FUT technique are removed after 14 days of hair transplant. After removal of sutures, it takes another 7 days for that area to heal. It will almost take you 2-3 weeks to return to work. Ugly scar: One of the constant side-effects of FUT hair transplant is the formation of a long ugly scar over the donor area of the scalp. 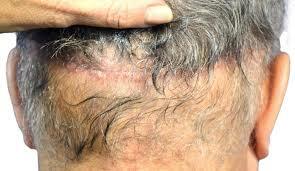 The skin closure after excision of the strip of donor skin leads to ugly scar over the scalp. This scar expands over the period of time even after the use of famous “Trichophytic Closure”. Hypertrophic scarring: one of the known complications of the scar over any part of the body is the formation of hypertrophic scarring. In FUT hair transplant hypertrophic scarring leads to scar becoming red, itchy and raised. Sometimes the scar becomes very painful. Infection and abscess formation can also occur in the hypertrophied scar. Keloid formation: though less common but potentially more dreaded complication of FUT hair transplant. In a keloid, the scar starts to spread over the surrounding normal skin just like skin cancer. The remedy for keloid is timely excision and flap cover. Cancer formation: Keloid over a period of many years can lead to skin cancer over the donor area of the scalp in FUT hair transplant. Cancer formation over a long-standing injury scar is rare but well-documented complication. For more information please go to the article whose link is given below and can also search another scientific article available over the internet, medical journals and all medical books. In FUT hair transplant After harvesting the strip of skin, the strip is divided multiple times into smaller and smaller bit. From the smaller bits of skin, the hair follicles are separated one by one. The hair follicle units obtained are dissected under microscopic visualization. While doing Hair transplant dissection under magnification is especially important to prevent follicle transection. The hair follicles are separated into clusters of 1-4 hairs which are called grafts. On average, a single naturally occurring hair follicle unit/graft contains about 2.3 hair follicles. The final separated hair follicle ready for hair transplant should have a pear shape. During Hair transplant, the epidermis has been maximally trimmed and the dermal and subcutaneous tissue surrounding the follicle isthmus and bulb remains intact. During Hair transplant, this optimal hair follicle shape is frequently achieved after FUT Technique. Hair transplant in Delhi says that the cushioning provided by these surrounding tissues has been found to maximize the hair follicle viability. This minimizes desiccation during pre-insertion storage and mechanical trauma to the follicle from handling during hair transplant surgery. Hair transplant in Delhi Selects a proper storage solution has grown increasingly more important in Hair transplant as “mega-session” hair transplantation involving slimmer grafts have become more common and out-of-body time has increased. Hair transplant in Delhi has shown that survival of transplanted grafts decreases by about 10% per hour out of the body time. Factors which reduce the graft survival during this extended out-of-body time include ischemia-induced hypoxemia and subsequent adenosine triphosphate depletion, as well as ischemia-reperfusion injury. At Hair transplant in Delhi, there are 3 types of storage media (intravenous fluids, culture media, and hypothermic tissue–holding solutions). We at Hair transplant in Delhi have noted that this helps minimize out-of-body variations in pH, osmotic balance, antioxidant capabilities, and nutrient support to the follicles. Preparation of the recipient area is done with betadine solution and draping is done keeping all aseptic precautions. Local anesthetic solution is then injected. At Hair transplant in Delhi, the recipient area is injected superficially first, followed by a slightly deep injection along the entire hairline to create field anesthesia. Hair transplant in Delhi uses various techniques to create and prepare the recipient area for Hair transplant hair follicles. The critical element with donor area preparation during Hair transplant is the angle and direction at which the hair follicles will leave the scalp leading to least damage to existing hairs. There is the creation of the natural hairline appearance of Hair transplant in Delhi centers. At Hair transplant in Delhi, we recommend that the density of hair follicle insertion at the recipient site is 100 – 120 hair follicular units per square centimeter. Some of the practitioners advocate for denser packing of more than 200 follicular units per square centimeter. we hair transplant in Delhi says that this can compromise the viability of the grafts as the competition between the transplanted hair follicles for a limited blood supply increases. Better would be to go for second sitting of hair transplant after 6 – 9 months to increase hair density further. Various techniques are used for recipient site creation and graft insertion. At Hair transplant in Delhi blades are cut to match the size of the follicular units to be inserted. At Some Hair transplant in Delhi centers hair transplant surgeons use hypodermic needles to make incisions for hair follicle placement. Recipient site size increases as the surgeon move posterior away from the hairline. The priority shifts from single, fine hairs to multiple, coarser hair follicular units while doing hair transplant more and more away from the front hairline. At Hair transplant in Delhi, a “stick-and-place” technique can be used to eliminate the time between which the recipient site is prepared and the hair follicle graft is placed within it. The “spread-and-place” technique at Hair transplant in Delhi reduces the mechanical trauma from hair follicle graft handling as the hair follicle is placed into a smaller recipient site. At Hair transplant in Delhi, for insertion of hair follicle imported forceps from Germany are used to gently place the grafts into the recipient sites. Transplanted hair follicle viability is maximized by minimizing the mechanical trauma to the follicle during its insertion. At Hair transplant in Delhi, this is accomplished by handling the dead portion of the hair (the part of hair which lies outside the scalp) rather than the sub-epidermal portion of the hair follicle itself. At our Hair transplant in Delhi center, hair implantation devices allow for near-simultaneous recipient site creation and hair follicle insertion. During Hair Treatment the patient is seated in a semi-recumbent position or prone position with head supported. Hair Transplant procedure should never be done in the hurry to finish the procedure. At hair transplant in Delhi, we are in no hurry to finish the procedure early as the final outcome of the patient depends on how diligently hair transplant is done on that very day.